Order your own copy of the Heroes of Terrinoth Gamemat at your local retailer or online through our website today! Heroes of Terrinoth, the cooperative adventure card game, sees aspiring heroes venturing forth on quests to defeat terrifying monsters, save vulnerable townsfolk, and recover valuable artifacts. While this is all undeniably exciting, it is also exceedingly dangerous. Exploring Terrinoth is not for the faint of heart, and as the undead rise and strange foes return, your heroes will need all the tools they can muster to ensure their success. The Heroes of Terrinoth Gamemat is available for order now, from your local retailer or our website! 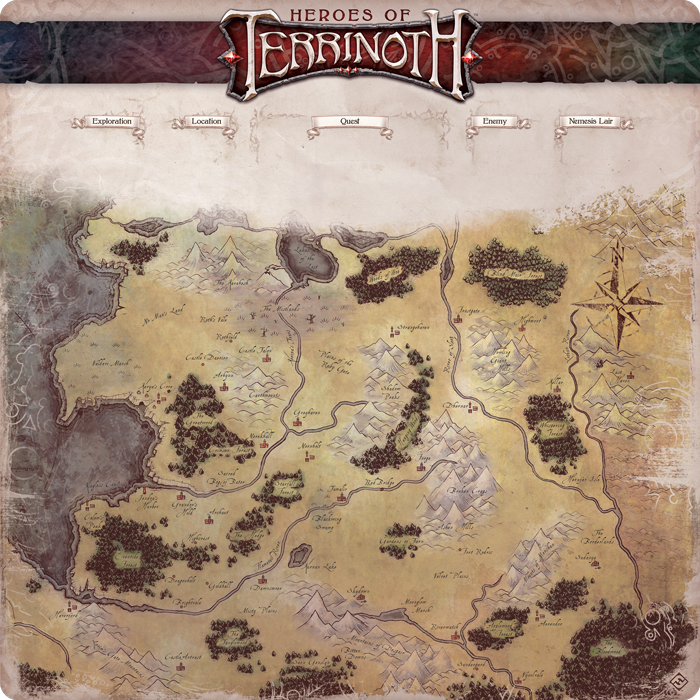 The Heroes of Terrinoth Gamemat is the perfect backdrop for your adventures in Terrinoth, providing a beautiful map of the region and plenty of space for you to play out your adventures. This 26" x 26" gamemat also provides organization to your adventures along with the room you need to battle the forces of evil. In fact, you'll find designated spaces for the exploration, enemy, and location decks, as well as your active quest and the nemesis lair. Prepare for your adventures with the Heroes of Terrinoth Gamemat! With no small amount of obstacles awaiting you and your friends, you’ll need all the help you can get to ascend to the same level as the heroes of old. With the Heroes of Terrinoth Gamemat, you’ll have an edge before you even take your first step. Prepare for adventure with the Heroes of Terrinoth Gamemat (TER02), available now from your local retailer or our website! Heroes of Terrinoth is a cooperative card game that turns one to four players into Terrinoth's bravest heroes. Embark of perilous quests, fight deadly foes, uncover priceless treasure, and earn fame and glory!